A modern addition to Sarah and David Richardson’s home has created an open-plan kitchen and living space where all the family can gather. Sarah and David Richardson were looking to buy a home in Battersea, southwest London, when they spotted a double-fronted, four-bedroom Victorian house on the same road they were renting on. ‘There are very few double-fronted houses in the area and, with four daughters to accommodate, we needed all the space we could get.’ says Sarah. The couples arranged a viewing and were pleased to find it had two good-sized reception rooms to one side of the hallway and a study and kitchen on the other. 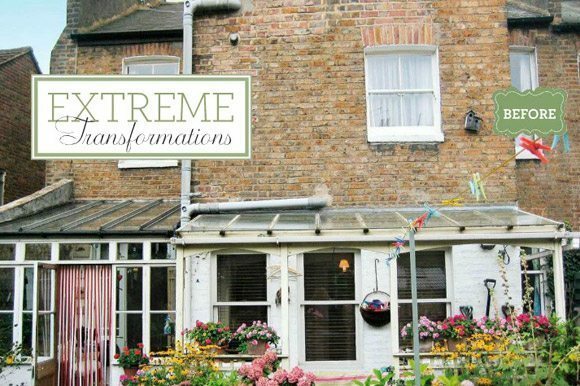 A tumbledown conservatory and a glass lean-to at the rear of the house were not quite as appealing, but Sarah and David could see the potential to replace them with a new extension at the back of the house. Sarah and David asked an architect to design a single-storey, glass fronted extension for an open-plan kitchen-diner and living area cross the width of the back of the house, plus a loft conversion to provide two more bedrooms. As time was critical for the family, the planning application was submitted as soon as contracts were exchanged on the house. The original plans for the rear extension included a flat roof, but this was assesses to be too intrusive for the couple’s neighbours, so their architect amended the design to incorporate a sloping roof. ‘In hindsight, we prefer the design we have, as the sloped slate roof matches the rest of the house.’ Says Sarah, who did a great deal of research and went to look at other extensions in the area to gather ideas. The loft conversion was completed before building work on the extension began in February 2011. The existing lean-to and conservatory were demolished and new foundations were excavated for the extension. A great deal of structural steelwork was fitted and brick and blockwork walls were built to tie in with the original house. Two large panels of glass at the tops of the side walls of the extension, plus two skylights and glazed external doors, flood the space with natural light. 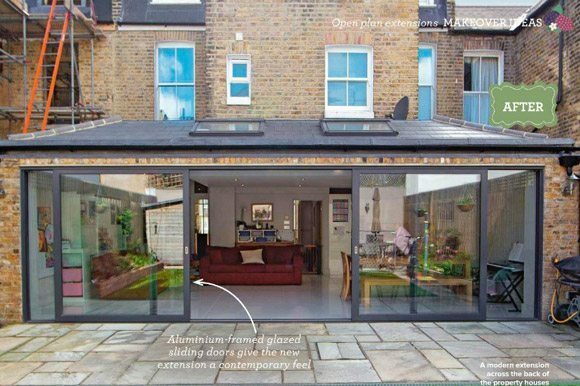 The aluminium-framed sliding glass doors were one of the more expensive elements of the project but ensure the new open-plan room links directly to the back garden. The Richardson’s single-storey extension was designed to give their family an open-plan kitchen-diner and living space. As supporting walls were knocked through, their builders carefully concealed the structural supports so as not to take away from the room’s contemporary, open feel. The supporting walls at the rear of the Richardson’s house had to be knocked down to create a large open-plan space, but Sarah wanted to avoid having a forest of structural steel beams visible. This design gives the end and sides of the room a pitched ceiling, creating more height in these spaces. The flat section of ceiling is inset with spotlights. Supporting beams are hidden inside the ceiling to give the room an open feel. ‘The extension took three months to complete. Sarah chose an off-white shade for the walls and a white high-gloss kitchen from Magnet. The Kitchen is situated in a part of the room that doesn’t have any windows, but there is a panel of glass set above the sink and breakfast bar,’ she says. ‘Having space for the children to play means the room is used all day’.